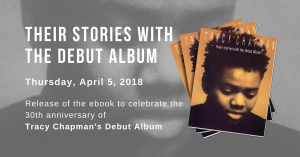 It was a musical choice for this week’s Cultural Toolbox, with John Fardy choosing American singer-songwriter Tracy Chapman’s self-titled, 1988 debut album for consideration. The album and Chapman’s career make for a great underdog story. A modest, shy singer – who had mostly performed in college coffee shops – releasing an album that flew against prevalent popular musical trends at the time (as John suggested, pop music ‘was on the verge of eating itself). Naturally, it went on to be a major hit both critically and commercially. “It’s very – I don’t want to say not well produced, far from it – but very small production on it,” John argued. “It’s guitar, it’s vocals, it’s a few other things – but it’s just beautiful songs. “I knew the album very well from back in the day, but listening to it again… there’s a lot of politics and social issues, but there’s some gorgeous music, and lovely love songs. And a lot of longing – longing for a better world, but also someone to go to bed with”. After Shane observed the album feels almost ‘out of time’, like something from the 1970s, John explained how the album has been credited with a lot of things, including the re-emergence of singer-songwriters. Shane said while he loved the album at the time of release and still really likes it, he feels it still has some of the weaknesses of the 70s albums – “the naive, left, folky truisms – it’s a little clunky and heavy-handed, some of the messages”. “It can be hard to get a great political slogan into a song without it being slightly clunky, so we’ll forgive her that,” John countered, and argued that some of the other songs are “harsh and on the money”. John and Shane also spent plenty of time discussing the meanings and lyrics of the album’s monster hit, Fast Car.